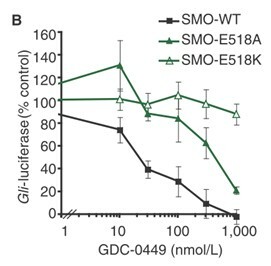 Gli-luciferase reporter activity of CH310T 1/2 cells transfected with indicated SMO constructs following a dose response of GDC-0449. Values were normalized to maximum activity levels and are mean±SD. Description Vismodegib (GDC-0449) is a potent, novel and specific inhibitor of hedgehog with IC50 of 3 nM and also inhibitor of P-gp with IC50 of 3.0 μM. Inhibition of cell survival and induction of apoptosis was observed within 24 h following exposure to this drug, but was maximally noticed at 72 h. In all the cell lines, GDC-0449 induced apoptosis is a dose-dependent manner reaching up to 65%. By comparison, GDC-0449 was less effective in inducing apoptosis in CSCs. Shh, Gli1, Gli2, Smo, Ptch1, and Sufu were analyzed by qRT-PCR in GDC-0449 treated and untreated groups. Stromal expression of Gli1 and Ptch1 was marginally lower in the treated group compared to the control. Given that Gli1 and Ptch1 are reliable markers of an active Hh pathway these results confirm the pharmacodynamic effect of GDC-0449. Expression of Gli2 and Shh followed the same trend. Tumor epithelial expression of Sufu was significantly lower in treated than in untreated controls. Immunohistochemical testing confirmed a decrease in Sufu expression in the tumor epithelium. Singh B N, Fu J, Srivastava R K, et al. Hedgehog signaling antagonist GDC-0449 (Vismodegib) inhibits pancreatic cancer stem cell characteristics: molecular mechanisms. PLoS One, 2011, 6(11): e27306. Karlou M, Lu J F, Wu G, et al. Hedgehog signaling inhibition by the small molecule smoothened inhibitor GDC-0449 in the bone forming prostate cancer xenograft MDA PCa 118b. The Prostate, 2012, 72(15): 1638-1647. 1. Expanded access study of patients with advanced basal cell carcinoma treated with the Hedgehog pathway inhibitor, vismodegib. J Am Acad Dermatol. 2014 Jan;70(1):60-9. doi: 10.1016/j.jaad.2013.09.012. Epub 2013 Nov 1. Vismodegib is a Hedgehog pathway inhibitor that was approved by FDA for the treatment of BCCs. 2. Vismodegib for the treatment of basal cell skin cancer. Am J Health Syst Pharm. 2013 Jun 15;70(12):1033-8. doi: 10.2146/ajhp120311. Vismodegib therapy has been reviewed. 3. Vismodegib suppresses TRAIL-mediated liver injury in a mouse model of nonalcoholic steatohepatitis. PLoS One. 2013 Jul 22;8(7):e70599. doi: 10.1371/journal.pone.0070599. Print 2013. Vismodegib is a hedgehog signaling pathway inhibitor that reduces apoptosis and TRAIL-mediated liver injury in an FFC-induced mouse model of NASH attenuating hepatic inflammation and fibrosis. 4. Evaluation of food effect on pharmacokinetics of vismodegib in advanced solid tumor patients. Clin Cancer Res. 2013 Jun 1;19(11):3059-67. doi: 10.1158/1078-0432.CCR-12-3829. Epub 2013 Apr 3. Effects of food on exposure of vismodegib, an FDA-approved anti-BCC drug, were explored in patients with advanced solid tumors. 5. A randomized phase II trial of vismodegib versus placebo with FOLFOX or FOLFIRI and bevacizumab in patients with previously untreated metastatic colorectal cancer. Clin Cancer Res. 2013 Jan 1;19(1):258-67. doi: 10.1158/1078-0432.CCR-12-1800. Epub 2012 Oct 18. The efficacy, safety and PKs of the combined therapy of vismodegib, a Hedgehog pathway inhibitor with anti-CRC activity, and standard mCRC treatment were assessed in a randomized trial. 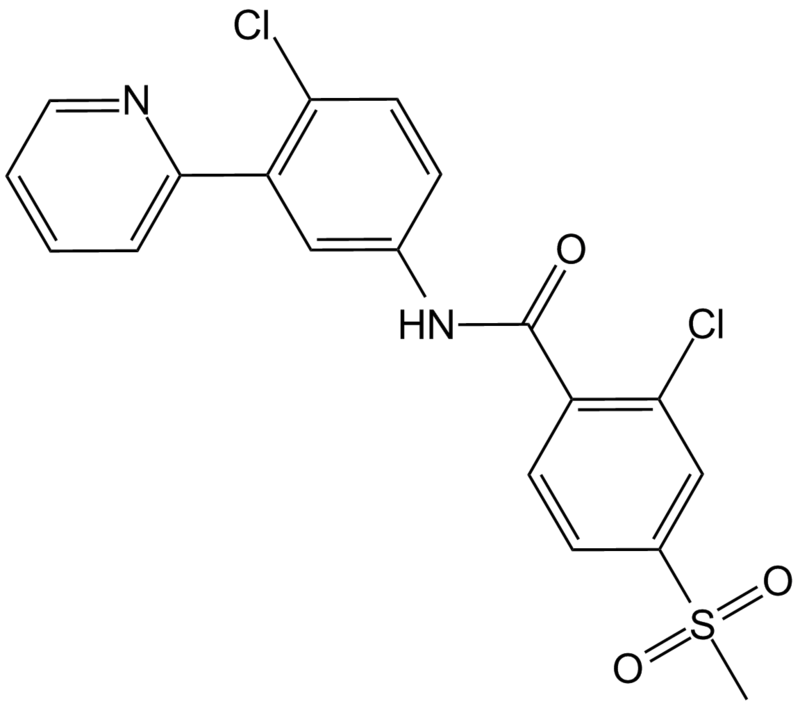 GDC-0449 (2-chloro-N-[4-chloro-3-pyridin-2-yl-phenyl]-4-methane-sulfonyl benzamide), discovered by high throughput screening of a small molecule compound library followed by subsequent optimization through medical chemistry, is a potent and selective inhibitor of hedgehog (Hh) signaling, a pathway regulating cell growth and differentiation associated in pathogenesis of several cancers. It binds to signaling by smoothened (SMO) and suppresses activation of downstream Hh target genes resulting in the inhibition of Hh signaling pathway. GDC-0449 exhibits anti-tumor activity in a mouse model of medulloblastoma as well as in primary human tumor cell xenograft models of colorectal cancer and pancreatic carcinoma and is currently being evaluated in research projects investigating refractory, locally advanced or metastatic solid tumors.